The staff was very helpful although didn't speak English, they called a taxi for me at night and I could go and come at night, they opened the gate for me. I like the room it's quite spacious for me and my friend. There was a hot water in the shower and the bed is big enough for us. It was huge for us to stay in that room. Удобное месторасположение относительно аэропорта (пешком минут 20 - 2 км). Бронировали специально на 1 ночь, по позднему прилету дошли пешком. Hotel 175 This rating is a reflection of how the property compares to the industry standard when it comes to price, facilities and services available. It's based on a self-evaluation by the property. Use this rating to help choose your stay! 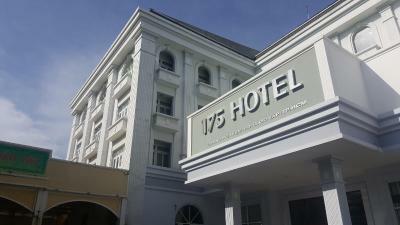 Hotel 175 offers accommodations in Ho Chi Minh City. Free WiFi is provided throughout the property. Each room at this hotel is air conditioned and has a flat-screen TV. The rooms have a private bathroom. For your comfort, you will find slippers and free toiletries. You will find a 24-hour front desk at the property. Other facilities include a tennis court. You can play tennis at the hotel. The nearest airport is Tan Son Nhat International Airport, 1.6 mi from the property. Go Vap District is a great choice for travelers interested in nightlife, street food and city walks. When would you like to stay at Hotel 175? Public parking is available on site (reservation is not needed) and costs VND 50000 per day. House Rules Hotel 175 takes special requests – add in the next step! Hotel 175 accepts these cards and reserves the right to temporarily hold an amount prior to arrival. The corridors were dirty, and I could hear the noise of the street. THE BREAKFAST COULD HAVE MORE CHIOCE. I checked quite late since my arrival in the airport got delayed which I didn't expect, the staff took quite long for us to understand and do the necessary stuff for us to be checked in our assigned room. It's frustrating that the staffs at that time couldn't understand English. The pair of slippers were of different sizes, in our 3rd-night pillow covers weren't changed. An in our last day, they didn't give us our breakfast which was included in our booking and most importantly they seemed rude to us. When we greeted them, they didn't bother to greet us back. A simple hi's, hello's, welcome and thank you would not hurt their ego. That's a simple greeting in English, hope they will try to learn and accommodate guests in a hospitable way. Facilities are so poor, dirty floor and towel.